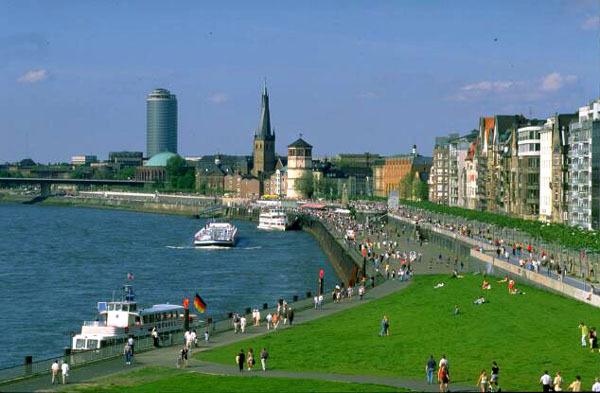 This project is easily one of the most successful waterfront transformations in Germany or anywhere else in Europe. As in so many other cities, this place used to be a wide urban expressway along the river, effectively cutting the city centre off from the riverfront. Finally, in the 1990's the authorities decided to put the expressway into a tunnel and create a new promenade on top. The new esplanade was designed by local designers Fritschi, Stahl, Baum on a very tight budget, as the cost of the tunnel kept rising and the budget for the public space was cut frequently. The design solution is therefore fairly simple and sometimes a bit rough, using straightforward contemporary design throughout. However, the simplicity, boldness and consistency seem to be the reasons for the success. There is a lower level entirely paved with tarmac (which is not as ugly as it sounds) which is used by skateboarders, inline skaters and cyclists. 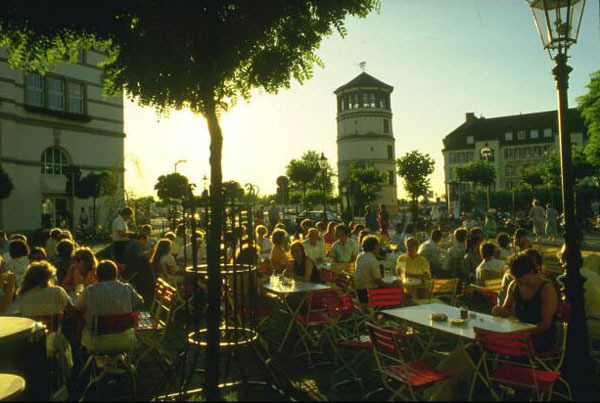 Several simple and temporary restaurants/ beer gardens with colourful awnings in front have been integrated into the flood wall (permanent structures are not allowed due to flooding). The upper level has two continuous rows of plane trees with benches in between. The southern stretch is wider and has a sloping lawn down to the river. 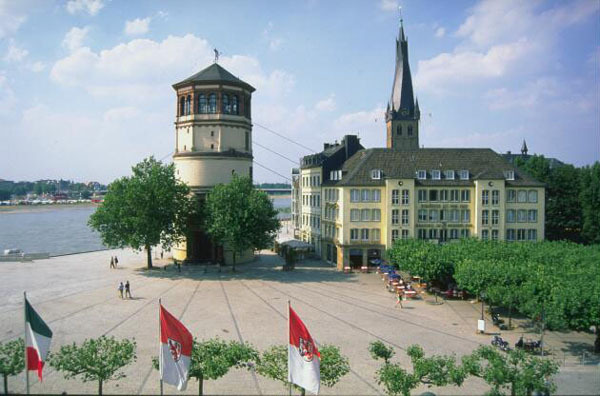 The northern stretch is more urban and features a re-designed square (Burgplatz) with steps down to the river. This is the place where people congregate in summer, sitting on the steps and watching the ships on the river pass by. 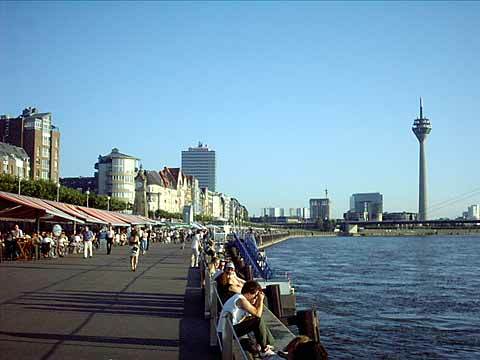 The neighbouring area, Duesseldorf's not-so-old post-war "Old Town" is Germany's largest and most vibrant nightlife area. The new promenade now allows for extension of the evening and night-time activities straight to the river. 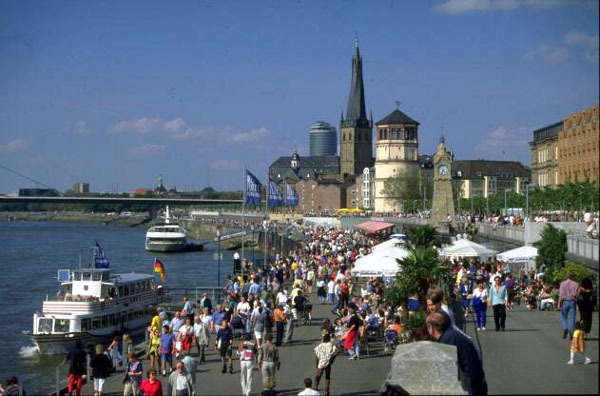 Thereby, the scheme creates new connections from the city centre to the river. The whole stretch of waterfront is almost completely pedestrianized now. It is also important to mention, that the scheme manages to extend the promenade southwards under a rather appalling expressway bridge leading further to the newly gentrified harbour area. In order to achieve this, the architects have placed a modern new theatre building right under the bridge to enliven the dark uninviting space under the bridge and to encourage passers-by to go further. The new waterfront is lined with residential and office buildings - most of them were in place already before the promenade was created. Unfortunately, not all of them have active ground levels. As the designers have put it: "To see and be seen, to watch other people, is the most important reason why people gather in public spaces - not fancy design features." Easy access for pedestrians. Many people nearby use the space, for example office workers and employees of nearby government buildings. 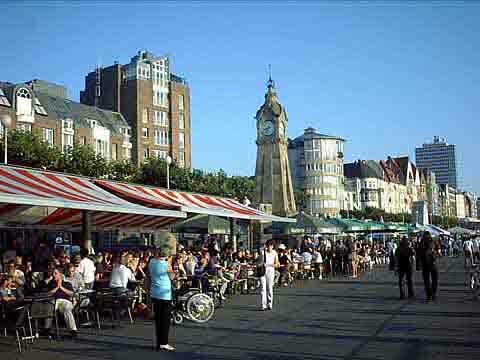 Car access is very limited and restricted; the promenade itself is largely pedestrianized, apart from some very small access roads. There is a subway/tram station nearby. Seating on benches under plane trees, clean and well-maintained, safe, no vehicles in sight. 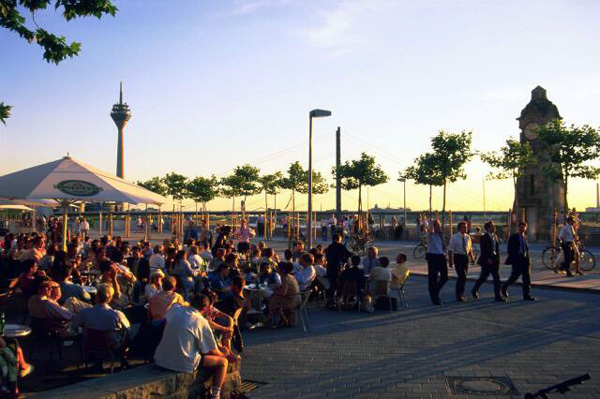 Activities on the promenade include: strolling, cycling, inline-skating, beergardens and restaurants, open-air-cinema in summer, sunbathing, and occasional public events (markets, exhibitions, concerts). 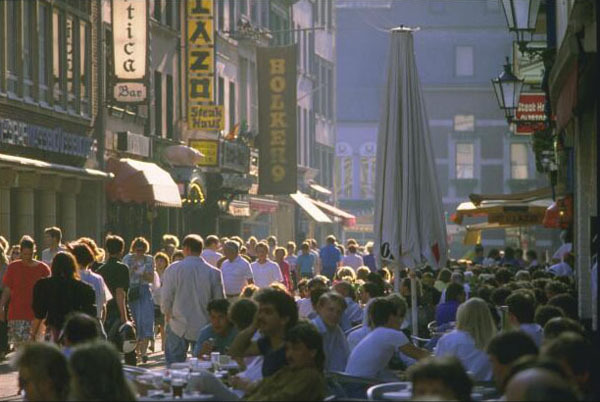 Vibrant, active, definitely a meeting place. You will find both visitors and locals here. 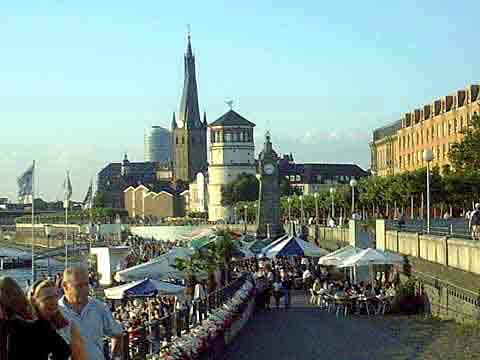 All images are contributed by Matthias Bauer.